A few weeks ago I picked up a box of Cashew Carrot Ginger soup at Whole Foods. I usually find pre-fab soups to be bland or ridiculously high in sodium and tend to avoid them but this one had amazing flavor. I’ve been on a mission to recreate it ever since and I think I’ve gotten pretty close! 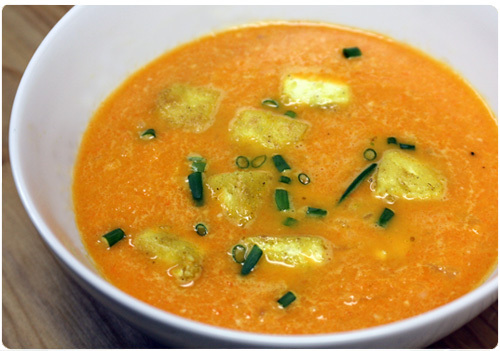 This soup packs big flavors, heavenly aromas and is completely vegetarian. I heartied it up a bit by adding some tofu, an idea I got from Food Network Magazine (which is great, btw), but you could skip it if tofu is not your thing. In a food processor, puree carrots, cashews and 1/2 C broth until smooth. In a large pot, saute diced onion in a little bit of olive oil. Grate ginger using a zester or a cheese grater and stir into onions, cooking until onions are soft. Season with salt and white pepper. Add carrot cashew puree to pot and stir in carrot juice, mixing well. Add remaining broth and coconut milk and simmer for 15-20 minutes. Season well with salt to bring out the flavors (it may require more than you think). Slice tofu into small cubes and pat dry. Mix flour, curry, ginger, salt and pepper in a small bowl. Mix in tofu cubes with your fingers until cubes are coated. Add oil to a hot saute pan and lightly fry tofu cubes until coating is slightly crisp and golden. Use a tongs to turn cubes and fry evenly. Serve soup with tofu cubes, cashews and sliced scallions. This sounds incredible! Thanks so much for the tip. Jenna wants me to make this for dinner on Good Friday when she’s home for Easter. Sounds delicious!